The New Year is approaching and for many around the world is that time to reflect and make some resolutions. The question is New Year Resolutions or Commitments, which one will work? Most people think of many kinds of resolutions to change physically or change a behavior or fix something. Well…it comes to no surprise that many of the resolutions fail within days or first three weeks of the new year, but why? First, Many Dictionaries defines resolution as “a thing determined upon; decision as to future action”. Perhaps if we changed from thinking of making resolutions to commitment, it would make the transitions easier? If you commit to something you change your entire mindset; it’s a decision as to present action. It sounds more engaging, more permanent, and more immediate! Remember, procrastination is NOT your friend! The real key lies in the following “commitment, not resolution” will get you to achieve your intended purpose. The word resolve means to decide to do something. The word commits means to devote oneself unreservedly to doing something. What a difference! Perhaps this is why our New Year’s resolutions don’t work. They are merely decisions to do something, often made at ten minutes before midnight because we feel we must make some resolutions. If they were, instead, commitments, something we could devote ourselves too unreservedly, we might just take them more seriously. Second, we might actually plan them with care and prudence well in advance of the stroke of midnight. We might break them down into manageable chunks that we could definitely achieve. And, we might be inclined to ask our higher power to help us keep them. After all, not many people are surprised if we tell them that we’ve broken our resolutions. Everyone does that. But, breaking one’s commitment is different. We probably wouldn’t even want anyone to know that we’ve broken our commitment. There are books and articles everywhere that can tell you how to make resolutions. They will tell you which ones are the best ones to make. Some writers believe that relationship resolutions are best. Others think that we only make resolutions because we feel there is a need to “fix” something in our lives. If you insist on carrying through with your usual tradition of making (and usually breaking) resolutions, you need only look to one of those authors for advice. However, my suggestion to everyone is that we make a commitment that we devote ourselves unreservedly, to setting aside a special time each day to study the word of God, and that we also devote ourselves to talking with God, praying, throughout the day. I know that making this kind of commitment will help us all in the other areas of our lives that need “alignment” and that is the spiritual side first. By faith on our higher power, we can lose weight, stop smoking, find more time to spend with our special someone and by committing ourselves to spending time with our higher power, we have a much better chance to achieve all of the other things we need to achieve in our lives. 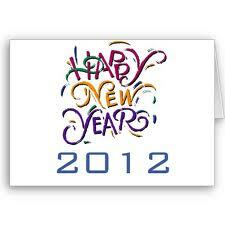 All in all, let’s commit to a great, safe, happy, prosperous and healthy 2012. Happy New Year! May you all have a “HAPPY AND PRODUCTIVE NEW YEAR”…use this symbolic time to renew our inner spirit and all will be added to you.